Our new Staff Guide – tell us what you think! Our brand new Staff Guide webpages are being trialled from today (Wednesday 10 October) and we’d love to know what you think. The new Guide has been developed following a key recommendation from the Simplifying Kent Internal Project Phase One that we need to find a better way of signposting colleagues to key information. A team, led by Wendy Raeside and Etienne Donzelot in Corporate Communications, have therefore spent the past few months developing an alternative to the existing Campus Online pages. 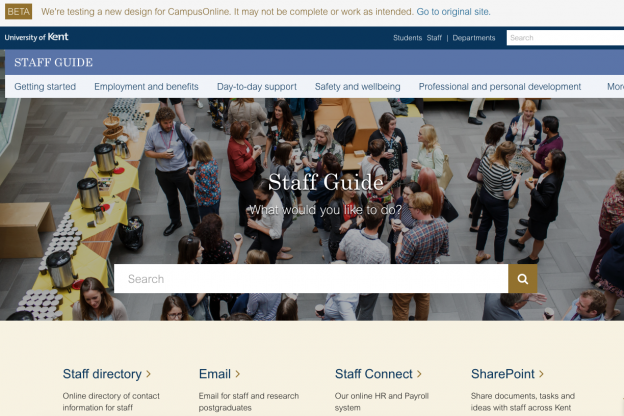 We have been working closely with colleagues in other key teams across the University, including WebDev and HR, to ensure the new pages contain everything you need to know about working at Kent. You will also see an A-Z section that lists some of the things we find difficult to locate at times – including University policies and regulations, and forms, as well as a How do I? of common staff queries, from claiming expenses to booking a meeting. A major feature is the new Search function which, in the first instance, is limited to information contained with the Staff Guide pages, and should help you find the key information you’re looking for. There are also prominent links to key services for staff, including Online Directory, Staff Connect, SharePoint and Emails. Lower down the home page, you will see highlights of latest staff interest stories, together with a link to the most recent Campus Online and News Centre stories. The Staff Guide is very much a work in progress – and updates will continue throughout the Beta phase – but we’d really appreciate your feedback on the overall design/content and particular sections you are interested in. Your feedback is key to ensuring that we get the correct content and the right links in place before launching the Guide as a replacement for the existing Campus Online webpages later this year. Please take a look at the Guide and tell us what you think by emailing Communications@kent.ac.uk before Friday 9 November 2018. This entry was posted in Campus online on 10 October 2018 by Wendy Raeside.